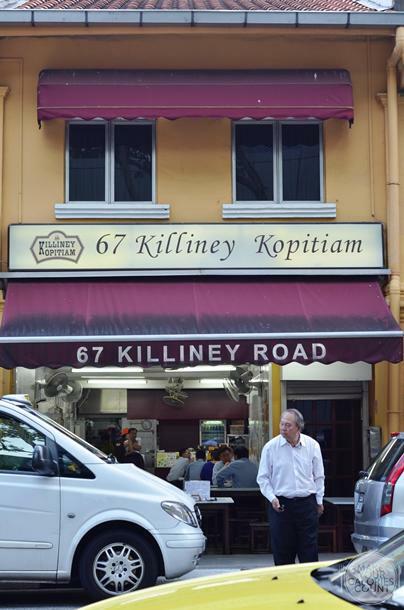 [SG] Killiney Kopitiam - the best kaya toast chain in Singapore? 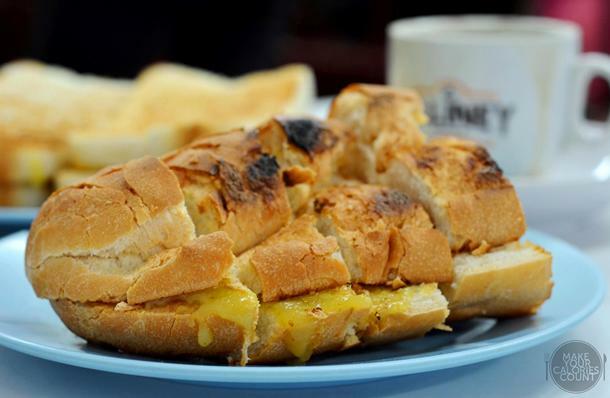 Growing up eating the traditional charcoal-grilled bread toast of Killiney Kopitiam, I cannot help but feel sentimental whenever I am in the vicinity of their flagship stall located on Killiney Road. With a humble beginning dating back to 1919, it is an eatery that I make special effort to visit whenever I am back home not simply for nostalgic sake but rather the quality of their kaya toasts and kopi-o-kosong that had kept my family as faithful patrons over the years. For some reason, I had always enjoyed my Killiney experience better at their original stall rather than at their franchises which can easily be found islandwide. For the Gen X (1980s) people like myself, you would probably witness the transformation that took place for Killiney. I still remember going there to takeaway the kaya (coconut jam) to bring over to UK every single time I am back in Singapore for vacations. The packaging and naturally the price had improved and risen over the years. The lady boss which can always be seen behind the cash till would never fail to ask about my overseas experience while carefully bubble-wrap my bottles of kaya. I still remember my first bottle of kaya which came in one of those transparent-looking cheap plastic bottles typically used for takeaways with no labels or logo which I had to bring home and transfer over to Tupperwares before bringing them overseas. Since then, it had undergone much revision and that elegant souvenir-looking glass bottle of today with proper branding and label is surely a sign of progressive development. Kaya is a coconut jam made from coconut milk, eggs, flavouring from pandan leaf and sugar. A food spread which originated from Southeast Asia, it is no surprise to see tropical ingredients such as santan (coconut milk) and pandan leaf as irreplaceable key elements to the jam. There are typically 2 types of kaya readily available in the market - green-coloured or golden-brown spread, each depending on the amount of pandan added and the extent of caramelization of the sugar. Having tried making kaya myself, I understand the tedious work involved in ensuring that no part of that mixture gets burnt in the cooking process. 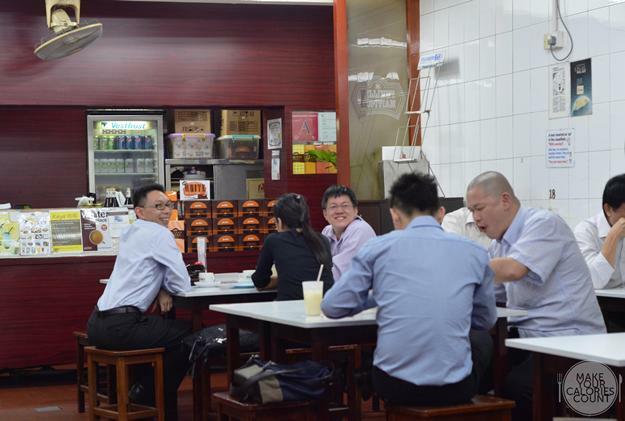 At the constantly busy eatery, you would be expected to place your orders at the counter in person though the dishes would be served to your table. 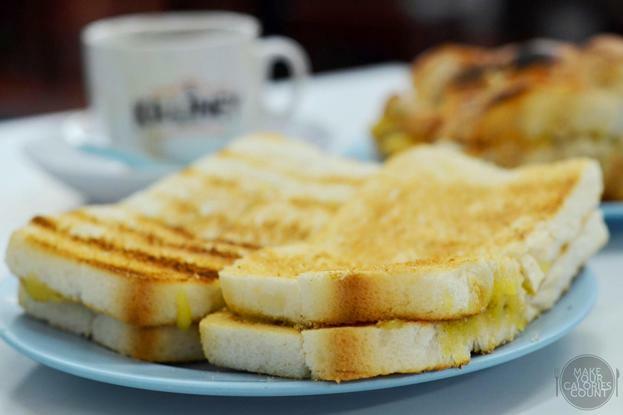 Is Killiney the best kaya toast chain in Singapore? We did our first tasting across the various kaya toast chains in Singapore in our very first post of this blog which may be found here. Without further ado, let our taste buds do the judging! Coming in a set of 2 pieces, it would come to S$2 for each order despite stating S$1/pc on the menu. We had 2 sets for sharing in addition to the two other types of toast they offered. As usual, the kaya stood up to the test with a strong egg flavour hinted by its pandan flavouring. Killiney's kaya has a unique differential element that sets it apart from its competitors and that comes down to the texture. With the abundance of eggs in the mixture, the texture of the kaya was cross-grained so expect dishevelled bits in that rich coconut jam. While it might lack smoothness in the spread for some, it suited my palate with the right level of sweetness, in excess just to please and not satiate one's appetite. The slab of sliced butter sandwiched between the toast was served at room temperature so it melted in our mouths with that beautiful kaya. If you are after a bold version of kaya dominated by egg and pandan flavours, then Killiney would be a good match. 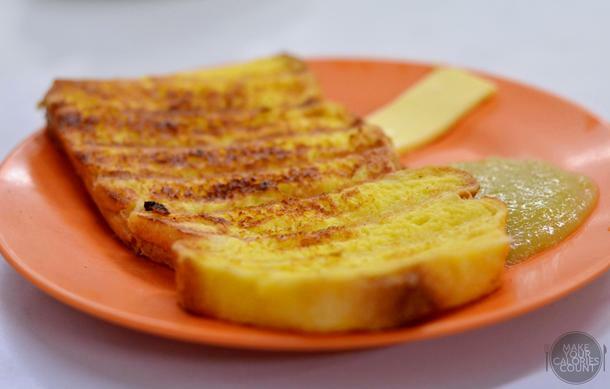 If you are a kaya toast fan like us, you will notice that the char-grilled toast was thicker than the ones served at Ya Kun. It maintained a thin layer of crispness on the surface yet fluffy and soft on the inside. 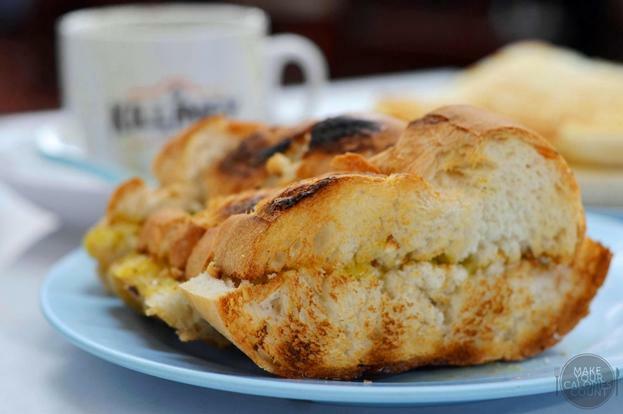 While we suspect that the bread used by both Killiney and Ya Kun originate from the same supplier from a humble bakery that operates 24 hours down at Whampoa (though Ya Kun serves a brown bread charactered by brown sugar), we are unable to confirm at the time of writing. There were no reasons to resist this delectable toast with that sharp crispness on the beautifully char-grilled french loaf that would surely leave crumbs all over the table. The surface of the french loaf had a nice crust which was well complemented by the soft inside. Sliced into half in the middle, a generous amount of kaya and slabs of butter were sandwiched to give it oomph. You could tell from the grill lines that special attention was given to the french loaf to have it toasted on the sides to give it an even texture throughout. The french toast would appeal to those with a heavier appetite as it had a strong egg taste to it. We loved the beautiful grill lines that were evenly cast across the soft toast. Expect the toast to be limp and soft, bogged down by the weight of the egg mixture soaked. It was however rather greasy but standalone, we liked that it was not too sweet as it would be expected to lay the kaya spread over the toast. A generous blob of the kaya was separately marred on the plate with a slice of the butter to go along. 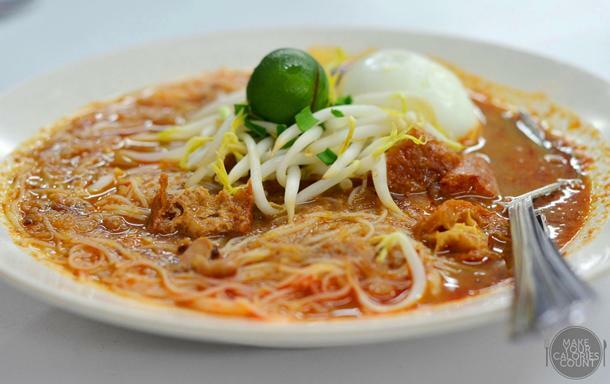 With a sudden craving for spicy food, we decided to order the mee siam. Quite frankly, it was my first time trying anything on the menu other than their toasts. I found it to be mediocre in taste and at S$4, I was expecting more and better quality. There was a good crunch from the fresh bean sprouts but the spicy, sweet and sour light gravy lacked intensity and depth. The flavours were not bold enough to make it a memorable dish and the offerings were little with a hard-boiled egg, pieces of sliced dried bean curd with vermicelli. The flavours of tamarind and calamansi managed to add tang and acidity to the dish but it lacked heat from the spices. It was an okay version of mee siam but not a dish which I would travel to try. We were attracted by the picture of the chendol dessert on the menu which were shown to be served in a tall glass. The dessert was in fact the first dish served, ahead of the savoury mee siam and the toasts. It was rather puzzling how the orders were being executed and I certainly do not regard it the norm to have my dessert (with shaved ice) before my mains. When asked about the discrepancy on the presentation of the dishes, the lady clarified that it is now served in a bowl for dining convenience sake. So I ended up questioning myself why did I order it in the first place and it did not come cheap, compared to what you would get elsewhere at hawker centres. 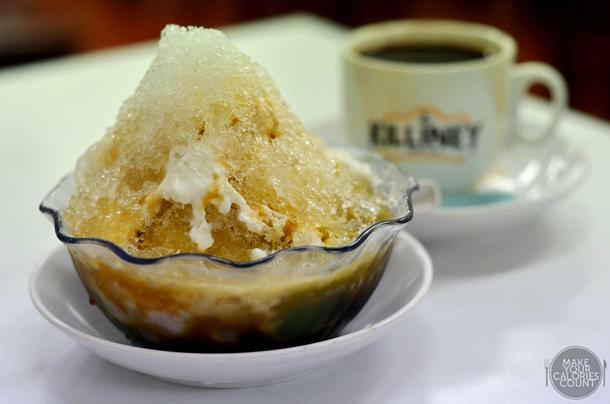 The shaved ice was rough and jagged and the gula melaka (palm sugar) was nowhere close to the kind of intensity that you would get from Jin Jin Desserts with their signature Power Chendol. This version tasted more on the creamier side, lacking the richness of melted palm sugar to deliver that oomph. The ingredients underneath that pile of shaved ice were plenty to go around sharing for the two of us, with the typical jelly noodles made from rice flour with pandan colouring and flavouring, red beans, grass jelly, creamed corn and not forgetting atap seed! I remained largely dismayed by the difference in presentation from the menu and that shaved ice was unforgiving to say the least. The kopi-o-kosong is a MUST-ORDER to satisfy the uncle-instincts in me and I always treasure the process of sipping freshly brewed dark roasted coffee through that petite coffee cup be it for reminiscence sake or to undergo that truly kopitiam experience and to end off with a contented 'Aahhhh' before returning the cup to its rightful saucer owner. The coffee served here has a dark roast nature with good strength and carried an intense flavour. The acidity was mild and was my preferred kind of caffeine. My unusual preference for kopitiam coffee had received some criticism that I do not appreciate and understand what is the good coffee. Many would probably argue that coffee served at kopitiams are not quite as good when you draw comparisons with the flamboyant cafes as the coffee beans are usually blended with corn in the process of stir-frying to enhance the flavours. Well, you cannot quite expect a coffee priced at a quarter of what you would be forking out at premium cafes to be of the same standard. Also when you are constantly in need of caffeine (and we are talking in excess of 4-5 cups daily), you will soon find the need for cheap and good alternatives. As Killiney continues to expand its business locally and worldwide (we tried the branch at Hong Kong - review may be found here), I insist in satisfying my craving for their kaya toasts at the original stall down Killiney Road whenever possible for sentimental sake and also I have the inclination that the original stall always produces the best quality possible. The prices on the menu were inclusive of GST and service charge, so what you see is what you pay. Fact or myth, I leave it to your discretion. 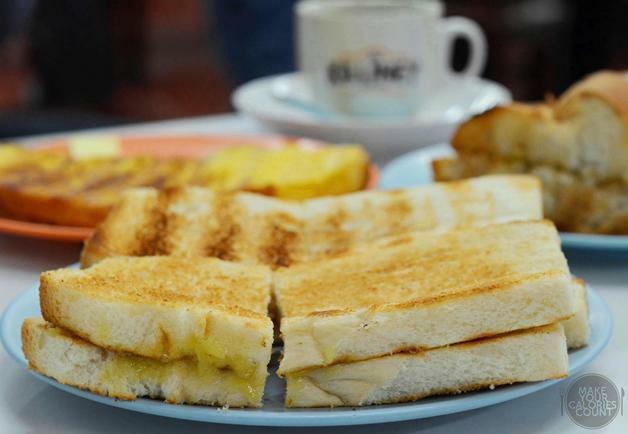 In order to answer the question of whether Killiney is the best kaya toast chain in Singapore, stay tuned for our follow-up review on its closest competitor, Ya Kun Kaya Toast. I want to know what brand of kaya & butter kiliney is using!! ?